Cover glass for making your own slides. Each cover slip is 18mm sq. Cover glass for making your own slides. Each cover slip is 22mm sq. Box of 72 blank slides, each 3� x 1� (75mm x 25mm). Approx. Single Concavity Slides are 1.2-1. Standard 1" x 3" blank glass slides (1-1.2mm thick) with 3/4" frosted glass for marking with pencil. Double Concavity Slides are 1.2-1. Double concave blank microscope slides are manufactured from high quality white glass sheets. 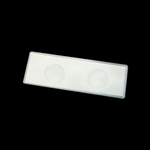 These are standard 1" x 3" slides with ground edges and range from 1.0mm - 1.3mm thick They have a double concave depression in the slide that is ideal for side-by-side viewing of liquid and other specimens. 72 slides per box. Single Concavity Slides are 1.2-1.3mm thick with one 15mm diameter wells approximately. 0.5mm deep. Packed in boxes of 12 slides. 144 slides total.per pack. Case of 20 boxes of 72 plain slides. Total number of slides is 1,440. Buy slides by the case, save $3 per box! Case of 20 boxes of 72 Premium slides. Premium slides have a lower incidence of scratch/digs.